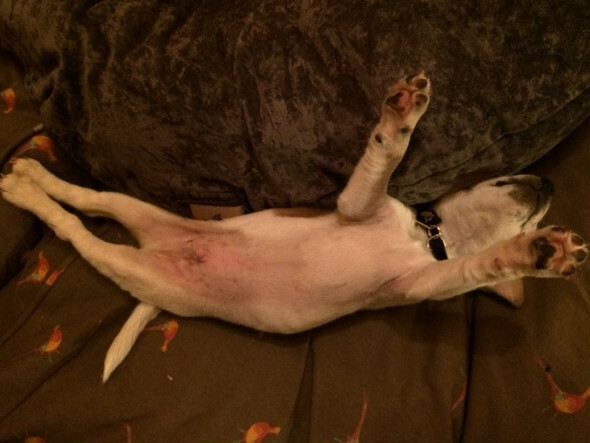 House of Mutt Blog » The Dude Diaries: Week One and it’s all about … Settling In. And Sleeping. … finding your feet, exploring, seeing what’s out there. And sleeping! Oh, and the less jolly bit about jabs. There are an increasing number of cases of Parvovirus and the like being reported by vet surgeries (see vaccinations debate and our policy for details) – it’s an urgent priority for me (quite apart from the House Rules element of it) to get Dude/all dogs fully vaccinated against those diseases that we can prevent them from getting.